Enchanting surroundings, endless blue and the designated golf course are some of the reasons, which could make your dream wedding in Costa Navarino a truly memorable experience. Indulge yourselves in the luxurious services Costa Navarino has to offer to both you and your guests for a weekend wedding and get lost in the magical scenery of Messinia. wander in between welcoming cafes and classic tavernas. Get a taste of the worldwide-acknowledged traditional olive oil from Kalamata area and why not offer it to your guests as a wedding gift to take with them an authentically Greek reminder of their presence to your wedding in Costa Navarino. Go for hitchhiking in the gorges and discover hidden waterfalls, swim in the turquoise waters of the blue lagoons and sunbathe under the golden sun. Dive in the crystal waters of Voidokilia beach where sand forms a semicircular strip of dunes that resembles the Greek letter omega. A famous blue gem located in Gialova lagoon, where you may relax after your dream wedding in Costa Navarino. 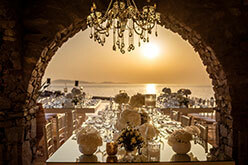 So what more do you need to host your amazing wedding in Costa Navarino and the land of ancient Messinia with the warmhearted hospitality and the beautiful Ionian Sea? Have a welcome party in Flame or Member’s Club and enjoy your drinks with the breathtaking view to Gialova as the sun goes down. Everything will be dressed in orange and gold by the sunset while your guests are mingling and you are looking forward to your wedding day in Costa Navarino. Let the exclusive and lavish settings of Pero Restaurant accommodate your wedding reception on the wooden deck located on the water. The secluded area where Pero Restaurant is, offers the intimacy you are looking for your wedding in Costa Navarino premises. Candles and hanging lanterns filling up the space will create the most romantic and warm atmosphere to celebrate love under the starry sky. Or you may have your elegant wedding reception in Flame Restaurant overlooking the magnificent golf course of Costa Navarino. Round tables dressed in warm colours accompanied with flower compositions will definitely make the most chic ambience for your wedding day in Costa Navarino. Light up sparklers and get the wedding party started in the Anax Club. Let the rhythm of the night take you away and make sure to show your moves. Party until dawn and observe how the sunrise illuminates the landscape of Costa Navarino unfolding in front of your eyes just by looking outside the window. Say thank you to your guests at a brunch in Barbouni restaurant. Enjoying a family style Bbq by the beach is the perfect and most warmhearted way to finish your wedding weekend in Costa Navarino. Let the magic place of Messinia, the Ionian breeze and the alluring settings of Costa Navarino to host your wedding and let The Twelve Events Team create the tailor made wedding of your dreams!